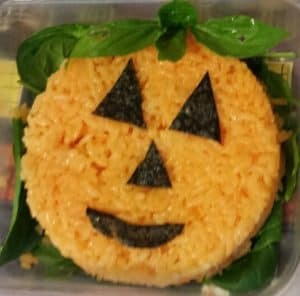 Home»Cooking, Cleaning and More»Adventures in Cooking»"I Love School" Lunch Boxes»Jack-O-Lantern Rice Ball for Halloween Lunches! Each school day I make my kids a fun lunch. 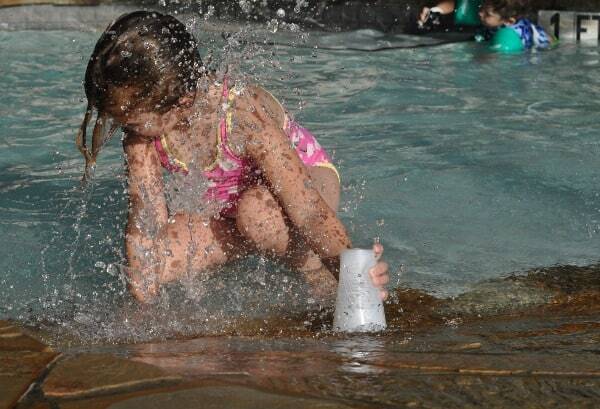 It started 2 years ago as a way to bribe my son to stay at preschool. We no longer have the same morning complaints, but we do have some tired kids at 6:00am and these lunches are good motivation to get us out the door on time! I was on business travel for much of this week, but I did manage to make a couple fun Halloween lunches before I left town. The best one was the Jack-O-Lantern rice ball. For instructions on making a rice ball, go HERE. For this rice ball, I used sushi rice and added a little food coloring to the rice cooker. Usually I use a rice mold to make a shape, but for this one I just wanted a big circle. Once I had a big rice circle, I used kitchen scissors to cut nori to make the Jack-O-Lantern face. I added a basil leaf stem and leaf and the rice ball was ready!